Experts at Pacific Northwest National Laboratory contributed to the U.S. Department of Energy's Office of Basic Energy Sciences report identifying the catalysis research needed to stretch the fossil fuel supply and to make biomass, hydrogen, and sunshine significant energy sources. Catalysis is the science and technologies of speeding and directing chemical reactions to quickly get desired products. 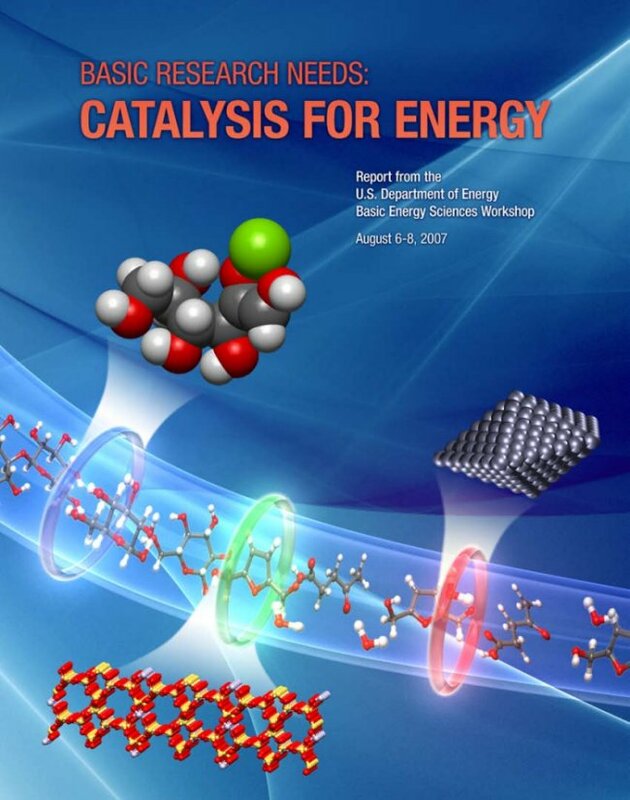 Advancing catalysis science may help solve problems such as high levels of pollutants in fossil fuels and low yields of needed chemicals from biomass. To create this report, which help direct the nation's scientific agenda, BES convened scientific experts at a 3-day workshop in August 2007. The workshop was organized into five panels: fossil fuels, biomass, converting water and sunshine into energy, broad or grand challenges in the field, and crosscutting scientific challenges. With the data gathered at the workshop and continuing discussions with the leaders of each panel, the three co-chairs assembled the 222-page report. The co-chairs were PNNL's Associate Laboratory Director for Fundamental & Computational Sciences Doug Ray, Alexis Bell from the University of California at Berkeley, and Bruce Gates from the University of California at Davis. At PNNL, Ray was aided by Mike Thompson in tasks as diverse as selecting experts for the panels to reviewing the pre-workshop technical perspectives paper. In addition, PNNL staff were involved with all phases of the report. Michael Henderson co-led the photo- and electro-driven conversion panel with Northwestern University and Argonne National Laboratory's Peter Stair. Bruce Garrett led the writing effort for the panel report on crosscutting theory and computational challenges. Chuck Peden, R. Morris Bullock, Wayne Hess, Doug Elliott, Jon Magnuson, Jud Virden, and Yong Wang were technical experts on the panel sessions. Further, Wang wrote the biomass section of the technical perspectives paper with assistance from PNNL's Don Stevens, John Holladay, Mark Gerber, Doug Elliott, Jim White, and Scott Baker. Wang also served as an expert on the panels. Many of the contributors were associated with PNNL's Institute for Interfacial Catalysis. The institute provide a fundamental understanding of catalytic materials and the chemical reactions occurring on catalyst surfaces and applies this understanding to developing industrial and environmental solutions. Preparing the final report and printing it were tasks undertaken by PNNL. The team included Denice Carrothers, Patricia Cleavenger, Kathryn Lang, Kristin Manke, Tomiann Parker, Elaine Schneider, and Barbara Wilson. Mike Perkins and Erich Vorpagel designed the cover. Rick Riensche and Nikki Avery supported the website. The report is available in pdf format at http://www.sc.doe.gov/bes/reports/list.html. A print-quality version is also available.